So, this post was requested by a couple people on my YouTube channel and a few people on Facebook agreed that this was something they'd like to see so I've spent the past few days cataloging, organizing & swatching the entire Makeup Geek product line (minus lipsticks, note on that at the end). I've also included a few extras like putting together suggestions of what to buy based on your eye color and/or skin tone, which was requested as well. If you like anything you see here, here's a link to the Makeup Geek store where you can purchase anything that might catch your eye. Now, this is a huge post with lots to get to, so let's not waste any more time and get straight down to the swatches! Makeup Geek Eyeshadows cost $5.99 to buy in pan form (which I recommend, pick up a Z-palette to store them in) or $7.99 in compact form. They come in over 60 colors and come in matte, shimmery, and sparkly textures. They are also cruelty free, and some shades are even vegan friendly. Okay, so let's just start out with the most neutral & natural shadows. Yes they have the least exciting pictures but as you can see from the Vanilla Bean pan, they are also some of my most used. I'm also about to hit pan on Latte and Mocha as well. These are almost all of the matte neutral shadows in the Makeup Geek collection, so if you're looking for a really basic starter kit of shadows that will work for just about anyone ... these are your super seven right here. Oh, and get Corrupt too. But more on that later. This set of shadows have primarily bronze or coppery undertones to them that make them look extra beautiful on warm skin. The orange and copper tones in these shadows will also provide beautiful contrast to blue eyes that will really make them stand out, while giving a natural glow and warmth to the skin as well. My favorites in this set are Cocoa Bear & Cosmopolitan. Now let's start getting into some bright colors! These three shades are a lot of fun to play with, even though Razzleberry and Mandarine aren't exactly everyday shadows. They also both have a lot of glitter in them, Razzleberry especially. This can make them even less practical for daytime wear but they are very pigmented and pretty. I would love to turn Razzleberry into a lip color with a little clear gloss, and Mango Tango works beautifully as a blush, so with a little creative thinking you can definitely find some uses for them even if they aren't the most wearable colors in the collection. More shadows that look gorgeous on warm toned skin! Bleached Blonde and Bling are excellent highlight shades and I use them all the time. Preppy is fabulous for contouring and Chickadee is amazing if you happen to have either Amber or Aqua Blue eyes. All in all though, they are pretty natural colors so they will suit most everyone. My favorites in this set are Bling and Gold Digger. Most of these greeny/yellow colors have a bit of gold shimmer to them which makes them best suited to those with medium olive skin. Fuji is very hard to work with on its own, so definitely use this over a white cream base if you want it to turn out. 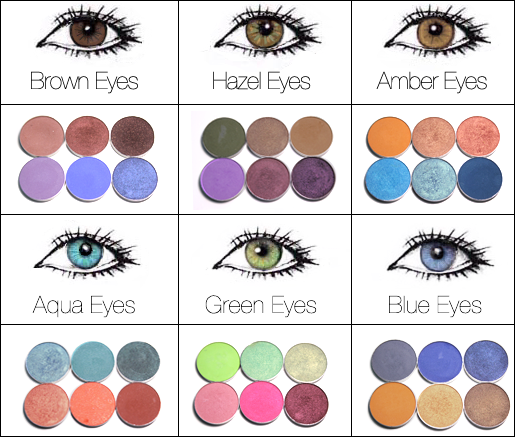 Dirty Martini, Poison Ivy & Shimmermint are also fabulous colors for those with hazel eyes. My favorites in this set are Pixie Dust and Appletini. Blue eyeshadows have a terrible reputation in the makeup world, but don't write them off so quickly! First of all, these are all more blue green than just blue, but more than that they have some sensational duo-chrome elements to them that look so beautiful you can't help but want to wear blue all the time. Poolside and Mermaid have a gorgeous golden sheen to them while Envy reflects a deep, deep forest green and Ocean Breeze is a really pretty almost indigo toned shadow. These look especially beautiful if you have deep brown eyes and look best when contrasted with some of the golden & brown eyeshadows for a complete complementary look. My favorites in this set are Mermaid, Poolside & Peacock. These three cool blue colors are gorgeous on those with pink undertones in the skin because of all the purple in them. Boo Berry can be a bit fussy to work with I've found, but Neptune is a great matte shadow and it blends beautifully with Nautica if you ever want to try a full on blue smokey eye, which you should. If you have cool tone skin and brown eyes, these are your go to colors for maximum facial flattery. Purple is one of the most universally flattering colors so most of these shadows are a safe bet, regardless of eye color and complexion. Though darker shades look best on medium or dark skin while brightly pigmented colors like Duchess and Wisteria are beautiful complements to dark green & brown eyes. This set has a mix of shadows in it that would suit all different kinds of people. For examples, Burlesque, Last Dance & Bitten are beautifully suited to warm, dark skin tones. Lighter alternatives like Simply Marlena & Cupcake are gorgeous on fair skinned girls with cool undertones in the skin. And just about any of these will work if you want to enhance gorgeous green eyes thanks to all the red in them. My favorites in this set are Bitten, Simply Marlena & Country Girl. Alright, we're almost all done! This set of swatches includes your standard staples like the matte white & black shadows (White Lies & Corrupt). I love that White Lies isn't a chalky at all so it's easy to blend with. Corrupt is an absolute must have for me. The swatch you see down there only took one layer of color, so I definitely recommend picking up one of those blacker than black bad boys - you won't regret it. The metallic greys are especially gorgeous on cool toned skin, or if you have steely blue or even grey eyes but they are neutral enough that anyone can pull them off. The Makeup Geek Gel Liners come in eleven different colors (I'm missing Fame, but have the rest) and cost $7.99 each. 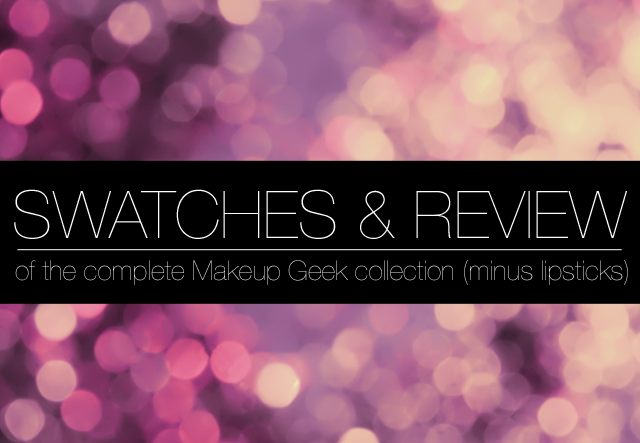 You can check out my in depth review here, or just look at these pretty swatches. Here is the basics of what you should know though; these things are fabulous. I can't praise them enough. I count these among the few products that actually stay on my waterline, and not only that but come out pigmented too. They also double as eyeshadow bases, which I use them for quite often. Fast drying, super durable and 100% water & smudge proof. TREASURE is a true gold liner that is amazing as an accent for blue eyes. POISON is hands down the best/only red eyeliner of this quality I've ever seen. Just avoid wearing it on the waterline. Not cute. TWINKLE gets better with every layer you apply and I also talk about my favorite way to wear it in the pigments section below. ELECTRIC is an awesome shockingly blue shade that I'm obsessed with lately and used in my Pretty as Peacock look. RAVE is a really unique shade that I'm at a loss for how to describe, but I just love looking at it. Kind of taupey brown but with a slight pinky purple shine to it. Gorgeous, unsung hero of the bunch for sure and I really need to make a point to use it more. MOBSTER is super practical and I wear at least once a week. The Makeup Geek pigments are the newest addition to the family. There are ten different colors in the collection and they are all really versatile. They each cost $6.99 which is a STEAL! The beauty of pigments is that there are so many different ways to use them. You can foil them to use as eyeliner, dust them on your cheeks as blush/highlighter, wear them loose as a lid color, mix with gloss and wear on your lips, even mix them up to make your own nail polish. The possibilities are almost endless. You should also know though that some of these swatches do not do the products any justice. Some things just don't photograph well (when you have low budget equipment like I do), so please don't be discouraged if the photos aren't enticing. Some of the best shadows translated the worst on film. My favorite colors here are New Years Eve, Paparazzi, Afterglow & Liquid Gold. BIRTHDAY WISH is my favorite for using in combination with bronzer for a really beachy glow or if you want to do a super sun kissed eyeshadow look. LIQUID GOLD is literally like swiping liquid gold over your skin. It looks absolutely heavenly on darker skin tones and it's magnificent for emphasizing blue eyes. Layer it underneath Sugarpill's Goldilux for the most incredible effect ever. ENCHANTED is a warm purpley red color that would be amazing as an accent for green eyes or anyone whose skin is on the cooler side of the spectrum. Probably my least favorite of the bunch but only because it doesn't particularly flatter my features. Nothing wrong with it as a color though. PRINCE CHARMING is a deep silvery metallic pigment that is so beautiful and reflective when worn as an all over lid color, especially with deep blue or blue grey eyes. PAPARAZZI is like SO EFFING GLITTERY AND BEAUTIFUL! If you do nothing else, buy Twinkle gel liner and use it as a base for Paparazzi for the most gorgeous, glittery, smokey eye everrrrrr. Ohmahgawd. INSOMNIA is a fabulous dupe for MAC's blue brown pigment and has a really pretty blue/green/teal iridescence to it that you can barely see here. I used it in my Rust & Roses look if you want to see how gorgeous it really is. NEW YEARS EVE is camera shy but she is STUNNING in person. Don't judge this shade by it's swatch. This white gold pigment is magnificently sparkly and I use it more than any other pigment. 10/10. Would repurchase in a second. SWEET DREAMS is a kind of peachy, shimmery shade that would be beautiful as a highlight on those with cooler undertones to the skin. PHEW! Okay, and that's basically it. I didn't include the lipsticks because this post is already overwhelmingly long so I'll save that for another day. To finish things off I've left you with this helpful graphic of what to try depending on your eye color. It's definitely not exhaustive, just some suggestions if you're not sure what to try/buy first. I hope you guys liked this post and found it useful! If there's anything that's missing, please let me know. And don't forget to check out the Makeup Geek store to see all their other goodies like their lipsticks, brushes, MAC samples & more.